The U.S.S. Enterprise is in pursuit of an unknown alien ship which has destroyed a Starfleet base on Cestus III. In an uncharted area of space, both the alien ship and the Enterprise are caught by an advanced race called Metrons. The Metrons are angry at the two ships for trespassing into their space and believe that physical combat is the answer to finding justice. 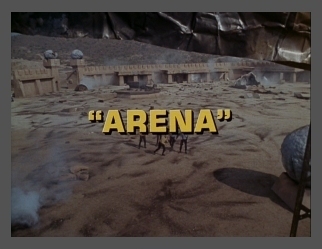 They transport Kirk and the alien captain, a lizard-like creature called a Gorn, to an uninhabited asteroid to fight to the death. The Metrons promise that the victor and his ship will be set free, while the loser will be destroyed, along with his ship and crew. The Gorn informs Kirk that the base on Cestus III was destroyed because it was believed to be a hostile intrusion on Gorn space. The Gorn is seven feet tall and much stronger than a human, with an extremely aggressive nature, but Kirk has the advantage of speed and agility that his opponent lacks. Kirk manages to keep out of the Gorn's way long enough to mix local minerals into gunpowder, which he uses in a primitive cannon to wound the Gorn captain. When Kirk refuses to kill the Gorn, the Metrons decide that there may be some hope for the human species after all. Both captains and their ships are set free. Another reason Kirk is a great captain. Underestimating youself a bit Kirk. for this one . . . Just kidding!!! Star Trek is a registered trademark of CBS Studios Inc. Ownership of all Star Trek images and sounds remains with CBS Studios Inc. This website is for entertainment and review purposes only. No copyright infringement is intended and no profit is being made. In fact, it costs me money every year to keep this site running. Please do not link directly to any file on this site. This website was designed, created and is maintained by Trekkieguy.